I spent the first year of active duty at Fort Campbell, KY, home of the 101st Airborne Division. In the spring of 1965 they received orders to ship out to Viet Nam. During the few months I had been at Fort Campbell I had seen Special Forces types and other infantry officers at the O’Club wearing their unit patches on their right shoulder, the privilege of those who have served in a combat zone, and I had envied them slightly. After all, the stated objective of all our training was to prepare us for combat. And Viet Nam was the only combat assignment available at the time. It was reputed to be “a lousy war, but the only one we had.” So there was a buzz of excitement when the 101st actually got orders to go there. The 937th Engineer Group was tasked to use their heavy equipment to help the 101st load their gear onto railroad cars for movement to the west coast. And then a few weeks later it was our turn. The 937th Engineer Group consisted of 3 Combat Engineer Battalions, a Panel Bridge Company, a Float Bridge Company, a Dump Truck Company and some other small units I have forgotten. Even though the total number of men and officers in the Group was over 1,000, I had been there long enough to feel like I knew most of them. I was transferred out of the 27th Engineer Battalion to help bring the 70th Engineer Battalion up to full strength. Other officers and men came from the 39th Engineer Battalion. I was given a few days leave before we embarked. As my parents and my girlfriend drove me to the airport to return to Fort Campbell my mother was very quiet. My girlfriend told me later that Mom was sure I would be killed. I do not remember being especially concerned; the optimism of youth. Back at Fort Campbell Ron Cotten, Larry Hallstom and I moved out of our house and temporarily into another that had just been vacated by 101st Division officers who left for Viet Nam. Larry was also on orders to go to Viet Nam. While Larry and I were packing our gear and watching the news on TV we saw a segment on how bad things were on Route 19 in Viet Nam. I made a mental note not to go there if I had a choice. I had recently read Bernard Fall’s book “Street Without Joy” which chronicled the French war in Indochina. Much of the action took place on Route 19, most notably the destruction of Groupment Mobile 100, a modern armored unit destroyed by peasant soldiers. We had no idea of where we were going. Only that we were going to Viet Nam. Just before we left I learned that the 101st Airborne officer who had occupied my room immediately before me had been killed shortly after arriving in Viet Nam. It was a sobering realization that the danger was real. The morning of Tuesday, 3 August 1966 we marched out to the airport at Fort Campbell to board the Super Constellation that would take us west to Oakland where we would board our ship, The General Mann. The Post Commander, General Powell, was there to see us off. As I passed him he asked me if I was ready to go and I replied with a hearty “Yes Sir!” And I meant it. I was young. I was single. I had never been out of the United States. I was ready for an adventure. On the afternoon of 5 August 1966 we set sail serenaded from the dock by the 2nd Army Band. I will never forget sailing past San Francisco and under the Golden Gate Bridge. It was a spectacular way to leave the USA. Nor will I forget the weather we encountered shortly thereafter. It became cold and overcast with large steady swells that rocked the ship continuously. I was enrolled in a correspondence course and thought I would take advantage of the free time on the cruise to complete some lessons. I may have lasted half an hour before motion sickness forced me topside. Fortunately for me I recovered quickly and was not again affected by seasickness. Not everyone was so lucky. One of my additional duties on board ship was troop compartment commander. In addition to men from HQ Co of the 70th the compartment contained men from the 31st Ordnance Company, the 697th Engineering Company (Pipe Line) and the 624th Quarter Master Company. Many were actively sick. In spite of attempts to clean up quickly, the persistent and lingering odor made others sick too. Consequently, the compartment a miserable place to be. As we sailed the weather either improved or we got used to the motion or some of both. The days became warm and sunny. I spent hours looking at the sea and sky. The water of the Pacific Ocean was the color of chipped chrome blue glass according to my journal. We saw several albatross, a good omen. Flying fish were occasionally seen skittering away from the boat’s bow. If we stayed on schedule, we might miss Friday the 13th altogether because of the International Date Line. Each morning in the Officer’s Mess our Filipino steward would offer us “Eggs starter”. It took us awhile to realize he was offering us “Eggs to order”. The days were leisurely, almost pleasant. I was on a “Slow Boat to (Indo)China” with attractive nurses from the hospital outfit at our table at every meal. I did a lot of reading, played tetherball and went to the movies in the evening. But reality was getting closer every day. I took the PT (Physical Training) pretty seriously and ran laps around the deck for I was not completely unconcerned about my safety and I wanted to be sure I was in good enough shape to outrun the VC. With time on our hands and the real possibility that some of us might not return I was prompted to do some serious thinking. Though my college major was engineering, I had been considering going to seminary to become an Episcopal clergyman. I planned to use my two years in the Army to make up my mind. One evening I sought out our Battalion Chaplain, Captain Hutchins, to discuss my decision with him. He was one of the most impressive officers of any branch I have ever known. Most Chaplains I met were mild mannered men happy to stay in the background. Not so for Captain Hutchins. A former enlisted man, he was the only Ranger Airborne Chaplain I ever met. Ranger school was notoriously difficult and only the fittest and the most mentally disciplined succeed. An Officer could not hope to rise above Major without his Ranger tab. You only get one chance and many wash out. In the course of our discussion I realized I probably should not become a clergyman; a decision that I believe time has proven correct. A few months after we arrived in-country Captain Hutchins transferred to an airborne infantry outfit. Shortly after I was not really surprised to read in Time Magazine that he had earned a Silver Star for his heroic actions while with the infantry. After two weeks of sailing we saw land for the first time; the Philippines. An active volcano on our starboard side as we passed through a narrow strait between islands was our unforgettable introduction to the Orient. 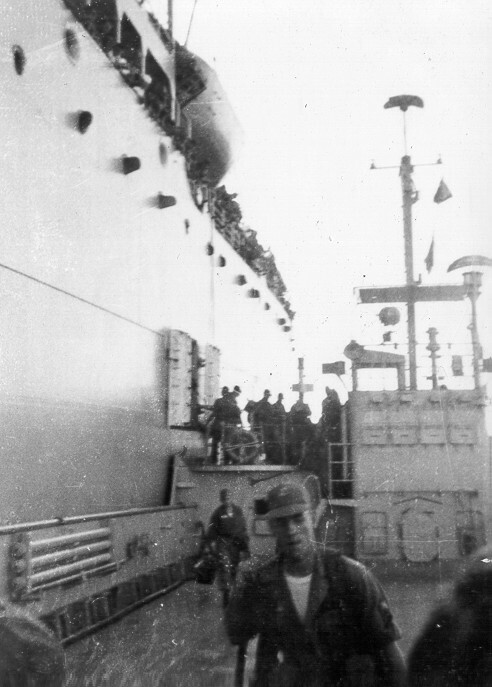 We landed in Subic Bay the next day and were given shore leave. Well, we were allowed to go to the clubs on the Naval Base. The town was off-limits. Once on dry land we realized that we had indeed gained our sea legs for the land would not stop rocking. A few intrepid souls did manage to sneak off base in spite of a barbed wire fence and a heavy guard of Marines. All too soon we returned to our ship and set off for our ultimate destination. Among the many rumors that were circulating was that there would be a blanket extension of active duty of between 6 and 18 months for everyone; bad news for the short timers. I had about 11 months left. A couple of days later on 24 August 1966 we arrived at Qui Nhon, the seaside terminus of the dreaded Route 19. We transferred into small amphibious craft that took us ashore where we waded ashore a la General MacArthur. We found our equipment and moved inland to our bivouac site near the junction of Routes 1 and 19. I was riding in a jeep with Headquarters Company’s First Sergeant Elrod. As we left the beach he looked at the mountains and sighed “Damn Sir. This looks a lot like Korea.” I would rather he had not said that. I began to wonder if my optimism about surviving my tour was misplaced. We named our bivouac site “Happy Valley” because we were just SOOO happy to be there. It was August, the dry season. Dry is a relative term. It may not have been raining but it was hot and very humid. And the odors. We were camped near a farmyard complete with pigs and roosters. Very early each morning the roosters would start crowing waking us much sooner than we wanted to get up. Amazingly, no one shot the damn birds. As Headquarters Company Executive Officer, one of my duties was to establish and supervise the company defensive perimeter. The first few nights especially everyone was edgy. Our first evening off the boat I was checking the perimeter at dusk to be sure everything was covered when I was told “Halt, Sir”. The commo section commander, who outranked me, had taken it upon himself to establish his own perimeter within the company perimeter, without informing me. Fortunately for me I knew the guys in the section pretty well. They were just playing their CO’s game. However, my estimate of my chance of surviving the year dropped a little more. Our accommodations in Happy Valley were pretty basic. I shared a pup tent with the Company Commander, Captain Fontes. He had transferred in from the 39th Engineer Battalion. I had known him slightly at Fort Campbell. In our discussions in our tent before going to sleep I learned that he had not gone to college and had earned a battlefield commission in Korea. Soon we got the word that we were to move inland to build a base camp for a division. At first our ultimate destination was unclear. Some rumors had us moving inland to An Khe and others had us staying at Happy Valley. Part of the Battalion went up to An Khe to repair some bridges and some of the HQ Co personnel were up there supporting with their equipment. As Pay Officer I flew up to find and pay our people. Following the dreaded Route 19 we flew Hueys across the coastal plain, up Mang Yang pass to An Khe and the Plantation that would eventually become the airfield site. Our first impression was that An Khe was a lot cooler than the coast. Finally the decision was made: We were all to go to An Khe and we began packing our gear to move. On September 3, 1966 we moved out. The move required several trips. Each trip would require passing the cemetery at the top of Mang Yang Pass where the dead of Groupment Mobile 100 lay; a sobering reminder of what a peasant army had done to a heavily armored modern unit. 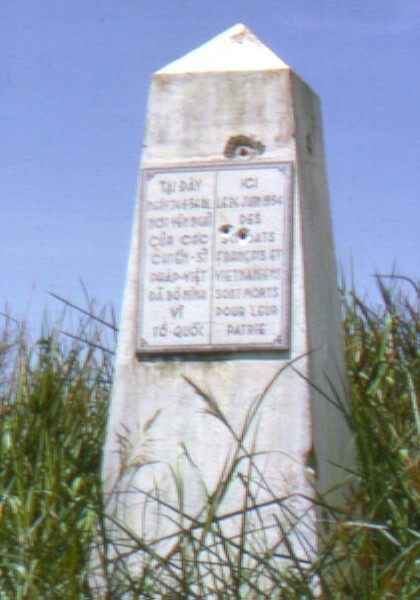 "Here on June 24, 1954, Soldiers of France and Vietnam Died for their Country"